Southwest Airlines sought more time last year to inspect fan blades like the one that snapped off during one of its flights Tuesday in an engine failure that left a passenger dead but said it fully complied with the required checks. 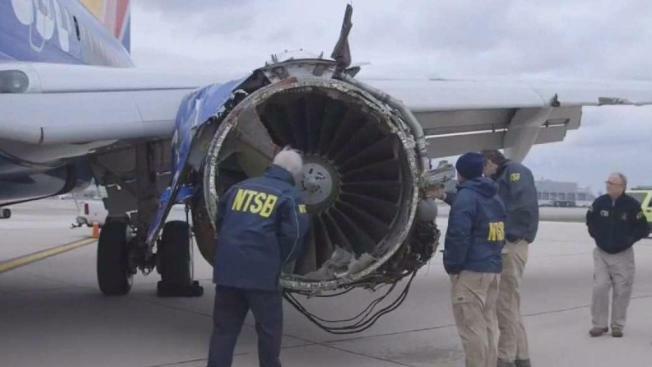 In a document obtained by NBC 5, Southwest asked to push the inspections out 18 months since the fan blades were not tracked by number and that they had 732 engines to ultrasonically inspect. The airline said in a statement late Thursday that it fully complied with the manufacturer's suggested inspections and did the checks without the government making them mandatory. "Southwest has satisfied the recommendations by implementing a program to inspect each blades on the engines identified," the statement said. The recommendation for more inspections followed an engine blowup on a 2016 Southwest flight. On Tuesday, an engine on another Southwest jet exploded over Pennsylvania, and debris hit the plane. A woman was sucked partway out of the jet when a window shattered. She died later from her injuries. The plane, a Boeing 737 headed from New York to Dallas with 149 people aboard, made an emergency landing in Philadelphia. A source familiar with the engine's maintenance records told NBC 5 Investigates it was manufactured in 1997, making it one of the oldest of its model, and was last overhauled six years ago.